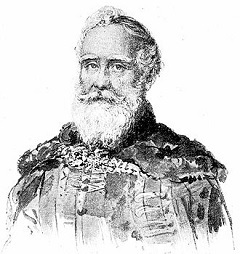 In the weeks following his defeat of Hungary’s 1848-49 revolution, the Austrian general Julius Jacob von Haynau consolidated his victory with enough cruelty to merit the title “Hangman of Arad.” On this date in 1849, he advanced Zsigmond Perényi, of late the speaker of revolutionary Hungary’s House of Magnates, to the ranks of Magyar martyrs. A career politician and judge, Perenyi (English Wikipedia entry | the more detailed Hungarian) was a stately 74 years of age when the barricades went up. He was a baron, but a member of the reform-minded faction of that class who in the 19th century came more and more to see themselves in a national, Hungarian context. This historical thrust would lead, 18 years after the events of this post, to the official arrangement of an Austro-Hungarian Empire, the promotion of Hungary to titular imperial partnership but never to a fully satisfactory settlement of the tensions between Hungarian patriotic aspiration and Habsburg imperial prerogatives. Perenyi signed the April 14, 1849 Hungarian Declaration of Independence; he and others who had set their hand to this treasonable document and played a role in the national government — they were just the sort of people to invite the attention of the hangman of Arad. “Many government commissioners who had supported Kossuth were summarily court-martialled and led to the gallows,” Alan Walker notes in Franz Liszt: The Weimar Years, 1848-1861, Volume 2. By Hungary’s own Franz Liszt.